These yarns, which are very much in demand, are now produced by the Fein-Elast Group on fully automatic, state-of-the-art SSM air-covering machines featuring electronic single-head selection and automatic doffers. The manufacture of air-covered yarns is our most efficient production process rendering it therefore particularly cost-effective. In this process, the elastane component is intermingled with a filament yarn using compressed air and wound straight onto the yarn spool. Air-covered yarns have a powdery look and an exceptional softness. They are mainly used for socks and seamless articles. 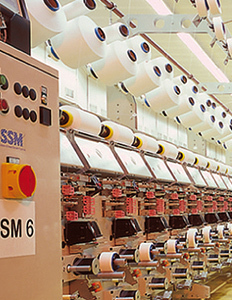 For the warp in weaving, air-covered yarns undergo an additional working step on a two-for-one twisting machine which means that the sizing process can be omitted. Hard twisting results in improved strength and evenness, giving the final product a smoother surface.